The Gym will be closed on Thursday (7-20-17) through Saturday (7-22-17) and regular operating hours will start back up on Monday (7-24-17). 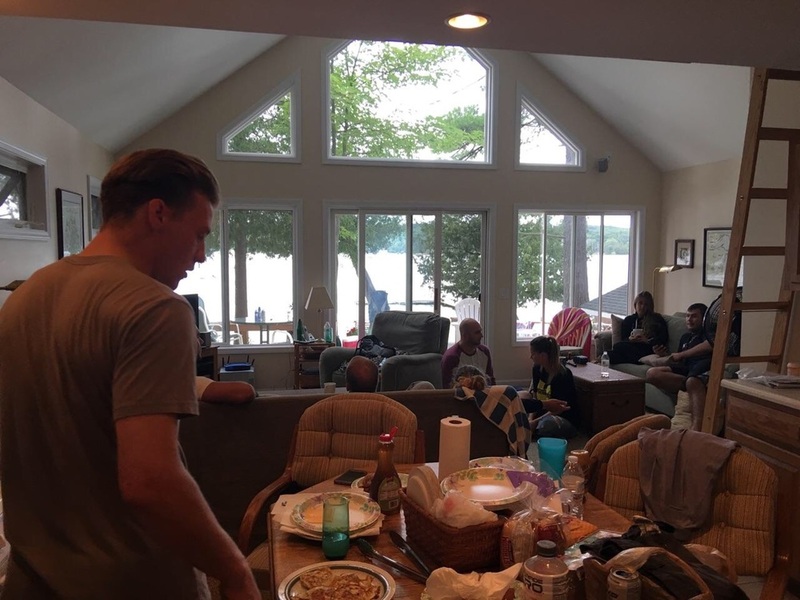 Annual KGJJ Camping retreat on Lake Charlevoix! This will be the second year in a row that we are doing this! All KGJJ Association Members are welcome to attend! See you all there! Contact me directly for info! Lukas will be testing for his Brown Belt along side Jose who will be testing for his Blue Belt. Starts at 9am. See you all there. Kroyler Gracie will be teaching a seminar at Black Lion at its new location! This seminar will be open to all schools and affiliations! See you all there for some amazing game changing techniques! More info on the link below. This seminar is open to all schools and affiliation! Hope to see everyone there! Check out the flyer for more info! We will be having our Christmas party on December 3rd at 630pm. Hope to see you all there! It will be a carry-in and we will have our usual White Elephant. Check out the facebook event for more info or updates. This Saturday (11-5-16) the KGJJ Team competed in the Michigan Open BJJ Tournament. For most of the competitors this time around this was their first time such as London, 7, (pictured above). London practicing her takedowns shortly before the competition started. Morgan accomplished a personal goal this Saturday and fought very well getting the Silver! Claude fought well submitting his way to the Bronze! Very proud of all these guys and gals for challenging themselves and for doing their best out there! Andrew (pictured above in black) had the smoothest and one of the most technical transitions of the tournament, incredible performance. I love this picture as it depicts that we arent just a team but a family, here you have everyone coaching Mitch after a long day, as he was one of the last to fight, with the same enthusiasm as they had that morning. Congratulations Cole "The Widowmaker" on your Bronze!! Shay showing some incredible dominance with KOB Kroyler Gracie Style. Very proud of Jose's first ever competition! Keep up the good! Great job Justin on submitting your way into silver! Congratulation Malik on dominating your way into Gold in your first tournament! I am incredibly proud of everyone that competed. To challenge yourselves to become better version of your previous self, that is what Jiu-Jitsu is all about. Everyone performed incredibly well and know that I am very proud to have you all on my team! Furthermore, I want to thank everyone that came out to support the team. You weren't even competing yet you made a point to wake up early drive several hours to the tournament to support the team. Whether you were there for moral support, to help coach, to record, to take pictures, to keep the team organized and aware of where everyone was competing at... Well needless to say thank you all. We will only improve between now and the next competition. Now its time to get back on the mats! 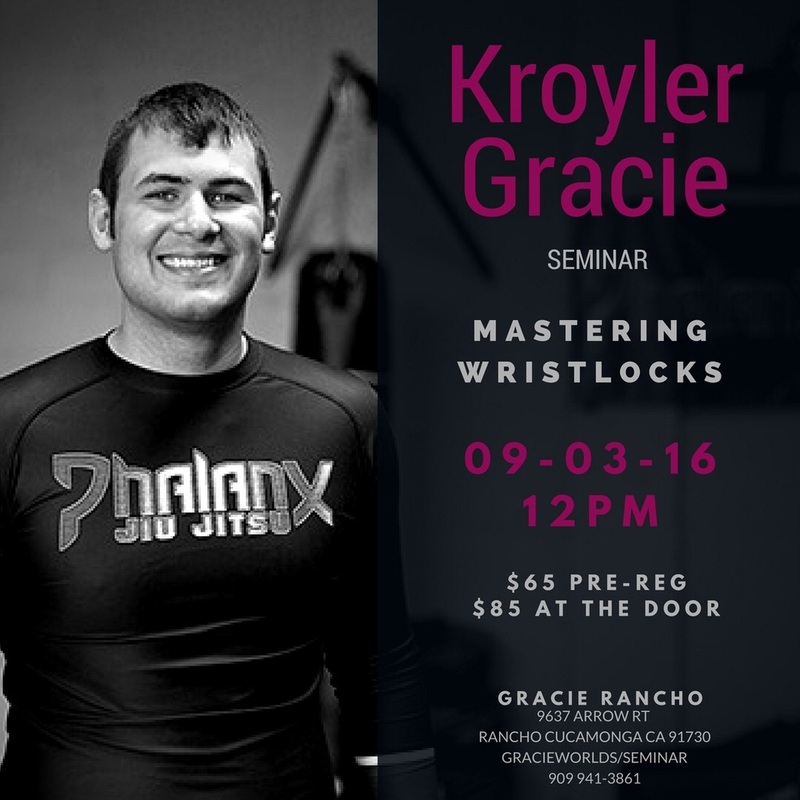 Kroyler will be returning to Gracie Sports Norwalk to teach a seminar on November 19th 2016. This seminar is open to all schools and all affiliations. Check out the flyer below for all the details! Thank you Drew for coming out again and teaching a great seminar! Thank you all that came out!! Drew Graber will be teaching a Wrestling Clinic on October 29th from 9am to 11am, $20 per person. Dont miss this opportunity to learn from one of the best Wrestlers from the Midwest! Judo Class following competition class this Saturday, taught by Nate! 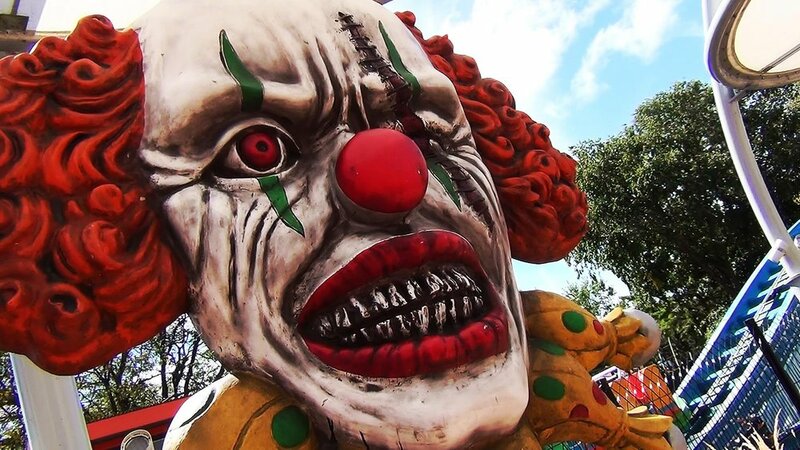 KGJJ Team trip to Cedar Point for Halloweekend! Talk to Kroyler for more info on how to attend! We will be hosting Drew Graber once again for a Wrestling Clinic. Drew is an incredibly well decorated wrestler with an outstanding record. Come join us for some high level wrestling training! The team will be competing at the Michigan Open Tournament so we wont have competition class this Saturday. Come on out and support the team instead! Kroyler will be visiting and teaching a seminar at Gracie Sports Macarra BJJ Norwalk. Check out the flyer for more info! Don't forget Nate is coming to the academy this weekend to teach another Judo Class after the competition class this Saturday (10/8/16). Don't miss this opportunity to take your Throwing Game to a new level! We have been working on dealing with an opponent that stands up in guard... This is our second series, and we aren't even halfway through. Check out the video below for a quick glimpse of the current series... Mind you the video doesn't do justice to the length and intricacy of this series. Come in and see us in person to see it all and learn it all for yourself. I will be visiting Gracie Jiu-Jitsu Rancho Cucamonga to teach a seminar of Wrist-lock Mastery! Hope to see and meet everyone there. If you have ever been caught or have had a wrist-lock fail for you, please come and attend the seminar so that we can further your understanding of wrist-locks. I guarantee that your Wrist-lock game will never be the same after this seminar. I taught a seminar covering Side-Mount Escapes and Attacks. If you missed it you must visit Chad Pomeroy and get the techniques and details from him at Blacklion! We also discussed philosophy and training concepts involving how we should all train and how we can be better training partners to one another as well as how our training partners are invaluable therefore we should invest on them as much as we wish for them to invest in us. Very happy to see Chad teaching everyone of all ages in a manner that influences and drives them to become better versions of themselves. If you are in the area I recommend paying him a visit, regardless of how much or how little training you have. Looking forward to my next visit! Judo Class starts back up this Saturday at 1030am! Don't miss this amazing opportunity, Nate DeCamp will be proctoring it! Movie night at 3pm, bring blankets and a pillow! Movie Night! Bring blankets and pillows and come out to enjoy a good time with the team! Starts at 1pm. Movie night! More info TBA. Cedar Point for the Halloweekend! More info TBA. I met Chad roughly 3-4 years ago and our friendship quickly took off. He became my first affiliate soon after having his first few classes with me. Since then I have gotten to know him and out of the mats. I soon noticed his skill level growing very quickly which meant he was taking what I was teaching and he was practicing it in and out. That showed me his ability as a student. But focusing on yourself is easy. We all want to be good, so when we find a routine or a path to getting better we all focus on it. We as humans like doing what we know we are good at. So I knew he was a good dedicated student. But as he represented me as my first affiliate I wanted to see if he would also grow as an instructor. Soon I saw his school growing, his students were all progressing very well. But his ability as an instructor was solidified in my mind when one of his students came to visit my school for a private lesson with me. He wanted to review a few things he had been working on with Chad. That student, Jesse, showed me the techniques he wanted to work on, and review, and check that he was performing them correctly. It was a very pleasant surprise to see that the techniques he was performing and had questions on were nearly flawless. This was proof that Chad was teaching in the manner I expect of myself. He focused on the overall growth of his students as well as his own. Jesse was proof of that. Very much like how Chad was a dedicated student under me, so was Jesse under Chad and I.
Jesse isn't the only one of Chad's students that is excelling and on the path of a constant growth. Morgan and Ben and many others are also excelling, which further cements my faith on Chad and his teaching ability. This Saturday I got the pleasure to promote Jesse to Purple belt after an amazing display of techniques. As well as Chad to Brown belt, Chad is my 3rd Brown belt ever. Thank you all that came out and showed support to Chad and Jesse. Again congratulations to both of you. Thank you Drew Graber for taking some time to visit us and put on an amazing single leg clinic! Hope to see you again soon! Congratulations on achieving your Brown Belt! The journey is still only starting! Thank you Morgan for helping us out with a place for our camping trip! We all had a most incredible time! We will most definitely be doing this again next year! Stay tuned for info and dates! Great times with the family!!! Enjoy this slick back-take from the kimura!! Come see us in person to learn the rest of the combos in this series!! I joined the #PhalanxArmy right as #PhalanxFc was going through its initial growth. I must congratulate Nick and Chris for their outstanding job not only in creating one of the biggest Jiu-Jitsu Apparel companies in the world but also for the culture they have created. 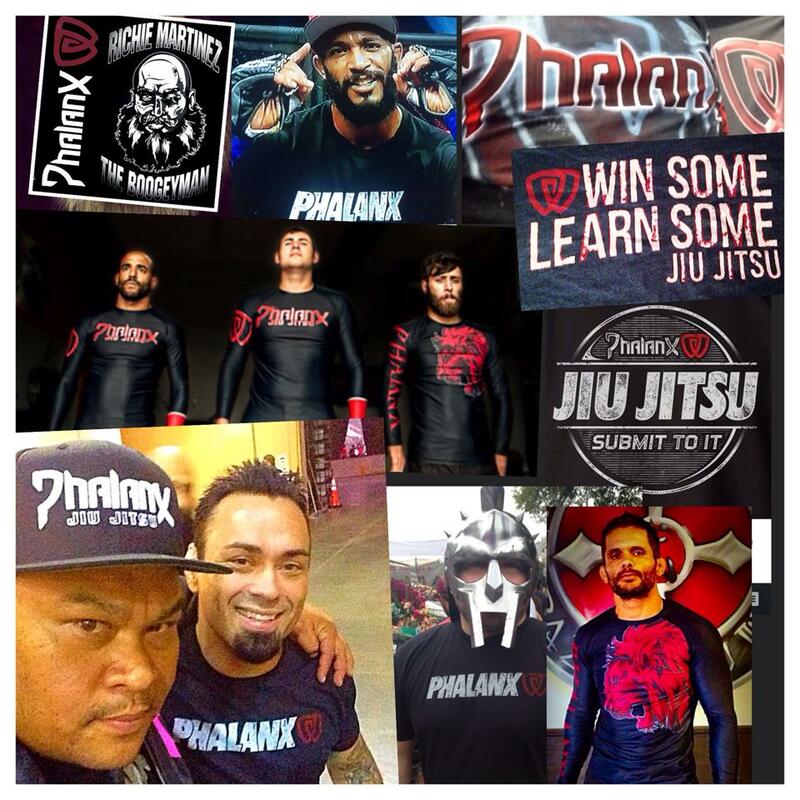 Throughout my years with Phalanx I have met a lot of their other Sponsored/Rep Athletes. We all have somehow been attracted to this company and we all feel as if we are part of it and the family that is Phalanx, which makes sense since they are pretty amazing; however we all come from different walks of life and that makes this accomplishment even more substantial. All the reps/athletes #Phalanxfc has brought into their circle is an addition to my family as I am sure we are to them as well. We have Rep Athletes that are on different teams and that sometime must even compete against one another should they meet in a tournament. The cool thing is if and when that happens the #Phalanxarmy athletes always give it their all during the match and afterwards they show nothing but love and respect to one another. This is credit to the maturity each of them has and for Jiu-Jitsu's ability to teach us to be better then themselves but also for Nick and Chris to have created a true family feel within the company. Again Congratulations Nick and Chris. Proud to be part of Phalanx as I am sure everyone else is as well. Gracie Regionals Chicago! Good luck to everyone competing!! 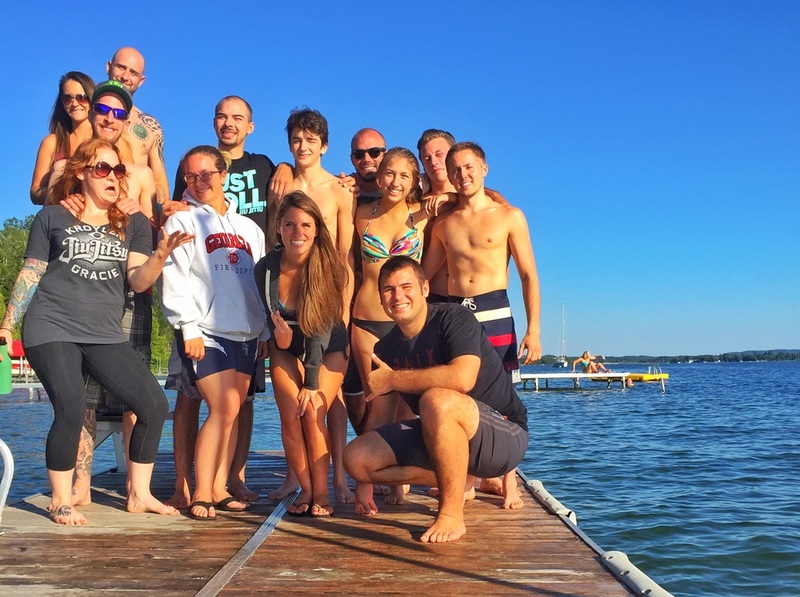 Camping/Cookout trip to Lake Charlevoix! All the info will be posted in the event page on Facebook! If you're not in the event page but are interested in going then contact me! Hope to see everyone from the team there! Kroyler will be teaching a seminar in Muskegon; this seminar is open to all schools and affiliations! Contact Jim Carey for more info! Drew Garber will be teaching a No-Gi seminar with emphasis on Single-Leg set-ups, follow-ups, finishes and counters. Drew Graber is a two time Indiana high school state wrestling runner up. Single season school takedown record. Career school take down record. Division 1 Cleveland state wrestling. Asst northridge high school wrestling coach. The seminar is open to all schools and it will be from 10am-12pm at 1632 E Bristol St, Elkhart, Indina 46514. Cost is $25. Movie Night! We will be watching Harry Potter and the Sorcerer's Stone, maybe a double feature (Harry Potter and the Chamber of Secretes) if everyone is up for it. Movie will start at 330pm. Bring friends and pillows and blankets. Movie Night! We will be watching Harry Potter and the Chamber of Secrets, maybe a double feature (Harry Potter and the Prisoner of Azkaban) if everyone is up for it. Movie will start at 330pm. Bring friends and pillows and blankets. Victor will be doing a Tough Mudder and has invited everyone/anyone that wants to join him to do so as well. Contact him for more info! Movie Night! We will be watching Harry Potter and the Prisoner of Azkaban, maybe a double feature (Harry Potter and the Goblet of Fire) if everyone is up for it. Movie will start at 330pm. Bring friends and pillows and blankets. Cedar Point for the Halloweekend! More information TBA.